LiveU: cellular uplinking in Spain and Portugal. Hackensack, NJ, March 2014 – LiveU (www.liveu.tv), the leader in portable live video acquisition, contribution and management solutions, has announced an exciting range of deployments across Spain and Portugal in 2013 with 2014 looking equally promising. Spanish broadcasters, RTVE and 13TV, and Medialuso in Portugal have all deployed LiveU technology to bring innovative and cost-effective live coverage to viewers. RTVE chose LiveU’s technology as part of an overall selection process for its “España Directo” programme. LiveU solutions were supplied by Overon, part of Mediapro, and the largest supplier of DSNGs in Spain. 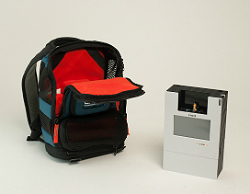 The programme, running over eight months, has benefited from four LU70 backpack units. The cellular uplinking technology has been used on a daily basis for live transmission in sometimes demanding conditions with producers able to take advantage of its mobility, speed of deployment and robustness. Meanwhile 13TV, an independent broadcaster in Spain has been successfully using three LiveU backpack units for its news output, bringing countless stories to an eager audience. Medialuso, Mediapro’s Portuguese offshoot and the largest production and services company in the country, has been using six LU70s for a range of production requirements with its customers. Media company A Bola has been using the technology for sports coverage (using 3G and 4G) while live news and events broadcasting has been the requirement from other clients, among them Porto Canal. The launch of Vodafone 4G in Spain was also covered using LiveU technology. This was an event with 1,500 Vodafone Spain employees. The CEO of Vodafone Spain and Portugal entered the employee convention and later the press conference on a Segway with a camera and a LU40 belt-clip unit, streaming at over 5Mbps constantly.